If your children love animals, the way mine do, then your family will be in for a animal adventure they will never forget! Daily 2 1/2 hour tours of over 300 animals will delight your child, and bring out the inner child in everyone young and old! For $21 each, you get a 2 1/2 hour tour, in which everyone gets a chance to milk a cow, feed a goat, pet a sheep, hold a baby chick, and a baby duck, catch a chicken, catch a duck, pet a turkey, and more! Included in the cost is a miniature train ride, a hayride, and a pony ride! Have you ever seen a Zorse?? It's half horse and half Zebra! They have one! I really loved this Petting Farm. The farm has it all. 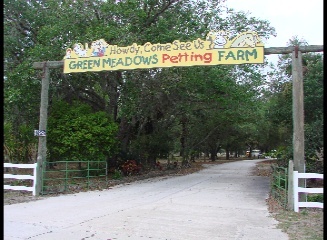 It is the best petting farm I have ever seen. They have bright colorful tractors that kids can climb on and pretend to drive. They have a beautiful koi pond with a bridge. A huge playground area and covered picnic area. You will see very rare and unusual peacocks walking around the park. The animals were happy, and well cared for in clean and shaded environments. I really appreciated the numerous hand sanitizing stations, and a portable handwashing station near the covered picnic area. At the end of your tour, take time out have a picnic lunch and relax for a few hours under the shaded live oak trees while the kids play on the large playground area. At the country store, you can find all kinds of yummy treats and some really cool animal souvenirs to take home! In the month of October, each child gets to take home a pumpkin from the pumpkin patch! A great time for all, and I hope that every child gets the chance to experience this special place!